I have an old post on this, but that only features the Lipglass, Lustreglass and the Dazzleglass, so this will rectify that now! lol! This post is not complete though - I'm missing the Dare to Wear, Plushglass and Lipgelee lipglosses! The first 3 colors are Cremesheen Glasses, and the last 3, Dazzleglasses. As you can see, these are essentially creamy colors. They do settle into the lines of your lips though, but this can be solved by using a lip primer beforehand. Like I mentioned earlier, this lipgloss is not sticky at all, but that also means that it disappears quickly so you'll need to reapply more often. These go for US$18 / RM80 for 2.7 g / 0.09 US oz each. Many people were irked by the lack of pigmentation of the Dazzleglass, so MAC came up with this (which makes me think that MAC actually do stalk online forums listen to their customers sometimes! :P). As you can see, these are significantly more pigmented than the Dazzleglasses! Certain shades however, have rather large glitter particles in them (particularly the lighter shades). Wao.. That's confusing. How come a lip gloss also can be so many type?? 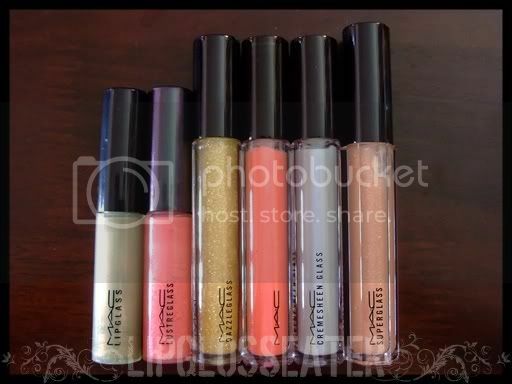 i have one MAC lipgloss but i hv no idea which type which colour is it. It's a gift from my bro in the set "look in a box". Wow Jenn! this is a wonderful post! You answered my MAC lipgloss woes! I just can't understand the difference and I will definitely ask people to check here if they have queries about these! :) Great job! Thanks a lot for this, it is so helpful! The creamsheens are my favorite, they are just sooo smooth and juicy on your lips and they last forever! I only treat myself to them once in a while, as I rip through a tube so fast, its not worth spending the $$! Wow, that's amazing. I love the chart you made. I make charts like that myself before I decide what to buy (I'm really big into comparing prices). I notice that you don't have any Chanel products on here. I've always been a glossimer girl. I bought a MAC lipglass a LONG time ago (when I was a teenager) and I hated it because it was so sticky and I told myself that I'd never buy MAC lip glosses again (my problem isn't the texture; it was with the gloss getting everywhere and making the TUBE sticky). But I've been drawn to the glosses recently because they're just so darn pretty! If you have any experience with Chanel glossimers, how would you compare them to any of the MAC glosses? Should I give the Dazzleglasses a try?